Parodying one of the most famous bands of all time and doing a pretty good job of it. 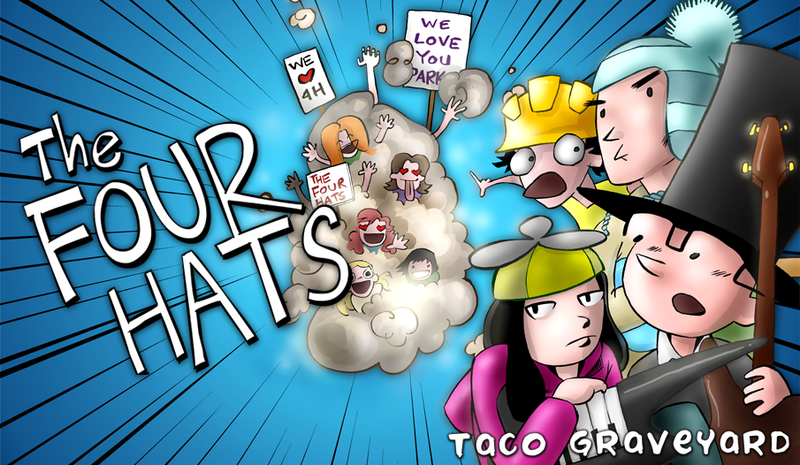 Taco Graveyard's The Four Hats is an addictive adventure that marries bite-sized mayhem with a quirky takeoff of A Hard Days' Night. In this fictional band's freshman outing, they're fleeing from mobs of rabid fans and paparazzi. It's a lighthearted endeavor that definitely doesn't take itself seriously: think Canabalt if you were Edward Cullen fleeing a gaggle of Twilight fangirls. Each of the 30+ stages tosses you right into the action with the band running for their lives through a range of different areas, such as quiet suburbs and even outer space. But the real meat of the game lies within deceptively simple core concepts. You can toggle between the Four Hats using the four-way selector at the bottom right of the screen. A context-sensitive action button regulates different actions. Lead singer Parker uses a quick sprint to lead him to safety. Danny, the bassist, rocks a dapper top hat under which he can hide. Holly, keytar player, can float from point A to point B. Gordo, the drummer, can bash through any debris placed in his path. Unfortunately, it's never as simple as moving from left to right. You'll need to change direction and orientation to forge the easiest path out of the public eye, often leaping over a pyramid of sedans or a line of mailboxes. The nearly constant switching puts a bit of a damper on the frenetic pace, and can be absolutely frustrating and disorienting until you become accustomed to it. Double-tapping to switch between bandmates doesn't always work as quickly as you need it to, and should you be touched by fans, the time you're out stunned is valuable time wasted -- you'll find yourself starting over more times than is necessary. This put a kink in the game's valued pick-up-and-play appeal, and could be frustrating enough to put less reflexive players off. Perhaps eliminating that extra tap could improve upon this round-robin gameplay, and allow for a little more leeway. Still, with its four original tracks and tongue-in-cheek pop culture references, The Four Hats is a delightful hidden gem that only hits the occasionally sour note. Switching between band members is absolutely daunting for new players (and even veterans) but eventually mastering the system is oh-so-satisfying. Can't buy us love? We don't think so. You can buy The Four Hats for 99 cents, and it's pretty close.